the main crew members always stayed the same. confident to say will make an awesome series. improved writing skills, this series is still trekking on into the new millenium. Originally, this Star Trek: TLC took place on a Miranda class starship and was named the USS Midway. In 1996, the ship class changed to a Nebula class and the ship was rechristened the USS Pheonix. US Navy and went away overseas. Upon completion of my military service at the beginning of 2001, the series was revamped. carries the name USS Endeavor-A. 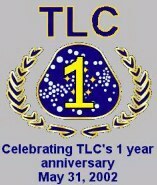 On May 31, 2002, TLC celebrated it's 1 year anniversary, and it directly cooincided with Star Trek's 35th anniversary. Nothing, really. I put alot of heart into them, as if they were real. For any one who is interested, I will publish your Trek fiction on this site. get the credit for writing it. Gene will continue to live on in our hearts as we continue to honor him.